Samsung and KDDI reached peak speeds of 1.7 Gbps and managed to upload and download high-res video files. In an effort to show off its progress in 5G technology, Samsung has completed a 5G demonstration onboard a moving train in partnership with the Japanese telecom KDDI. The Korean electronics manufacturer utilised a 5G router, 5G radio access unit, virtualised RAN (vRAN) and a virtualised core to make up its pre-commercial 5G solution which was used to to complete the test that achieved peak speeds of 1.7Gbps along with the download of 8K video and upload of 4K video. 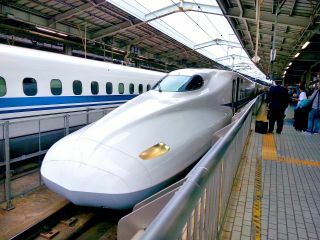 The hi-speed train used in the tests travelled faster than 100km/h between two stations in Saitama, Japan. Both the upload and download capabilities of the 5G network were tested an 8K video being downloaded via a router onboard and a 4K video filmed by a camera on top of the train was uploaded during the trip. Samsung sees a great deal of potential in equipping trains with 5G which could be used to help improve passenger entertainment and information services and could also serve as a backhaul for onboard Wi-Fi. "In collaboration with Samsung, KDDI has opened up the possibility for new 5G vertical business models, such as a high-speed train. With 5G expected to bring railway services to a whole new dimension, the success of today's demonstration in everyday locations such as a train and a train station is an important milestone indicating 5G commercialisation is near." KDDI has collaborated with Samsung on 5G solutions since 2015 and the telecom plans to continue their partnership as it makes preparations to launch its 5G network by 2020.